This is a simple riff on a Heidi Swanson recipe banged out in response to my son’s sudden desire to purchase a butternut squash. René is deeply enamored of books about gardening, and Strega Nona’s Harvest is one of our longest running favorites around here. The winter squash element, hardly seasonally appropriate, may seem a bit off putting at first, but I did make use of some market chives here, and this sweet-savory, soft-crunchy room temperature salad is a welcome addition to a late spring lunch. I have made the recipe several times with the kobocha squash, this is easier and quicker. Kabocha is a bear to cut and peel. I have almost always used fennel in place of the celery, and chopped dried tart cherries in place of the currants – I always sub cider for the beer. Luckily for me, René doesn’t like beer. 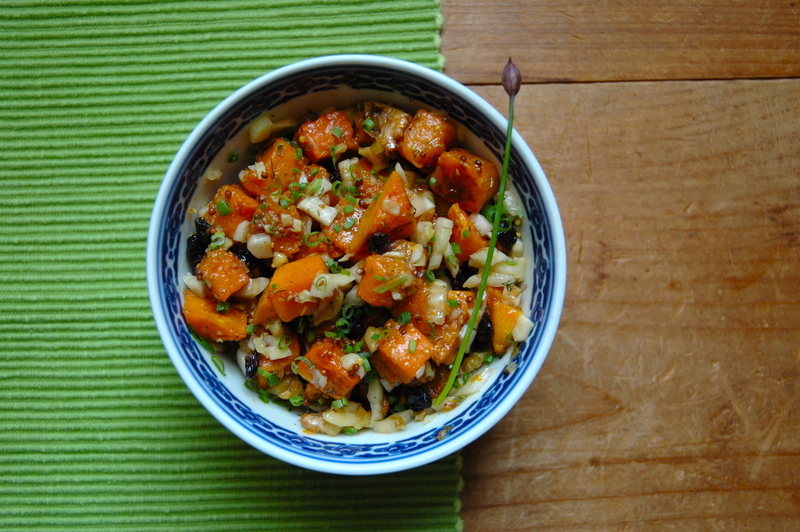 On a large rimmed baking sheet lined with parchment, toss the diced squash with a few nice glugs of olive oil (2 tbsp? ), and a sprinkling of kosher salf and fresh ground pepper. Bake, stirring once or twice, in a pre-heated 400 degree oven for 25-35 minutes, or until tender and browned on a few sides. Remove from oven and allow to cool while preparing the dressing and other veg. In a large bowl place the fennel, currants, walnuts and chives. Add the cooled squash, and about 2/3 of the dressing, toss to coat. Taste, adjust seasonings, and allow to sit for 10- 15 minutes. Taste again. As Swanson points out, the squash will drink up a lot of the dressing as it sits, how much you need will vary sightly – dress to taste.